This gourmet Italian heirloom tomato is considered the best for fresh sauce, paste, roasting and drying. The rich thick flesh with few seeds has a thin skin that makes it easy to peel. 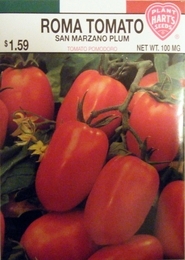 These are indeterminate plants that will continue to produce fruit over a longer season than determinate plum tomatoes. Provide support, vines will grow to 6 feet tall.